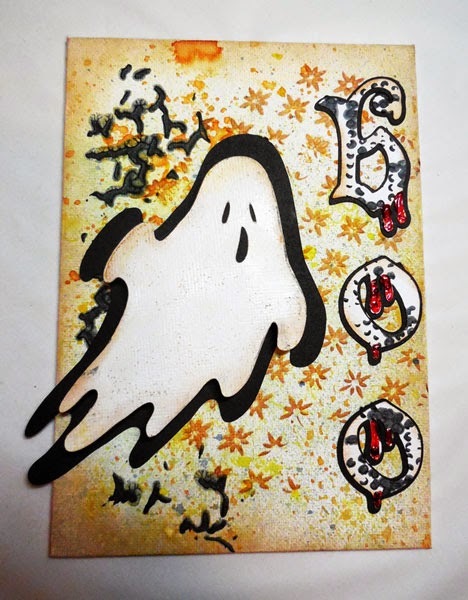 Good morning all, Steph Ackerman here with a quick and easy spooky canvas that the kids (both young and old) can create as they get ready for the spookiest day of the year. If you are having a Halloween party, why not have the kids create a project. 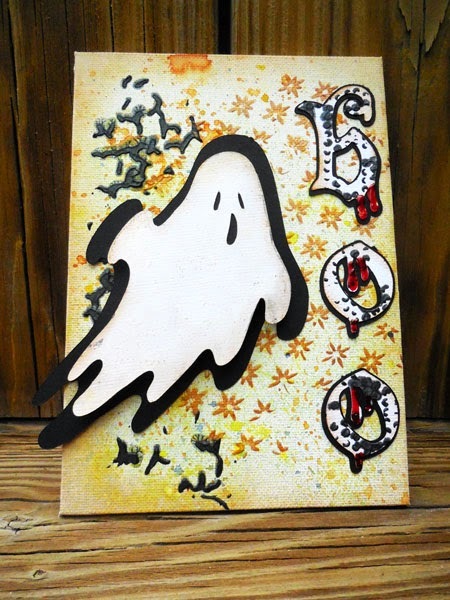 All you need is a small canvas, some Art Anthology paints, assorted stencils and die cuts or stickers. 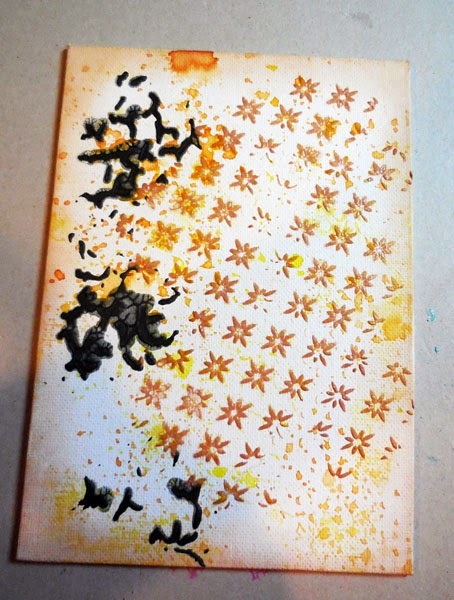 On the canvas I placed The Crafter's Workshop Mini North Star Stencil, then spritzed some Art Anthology Timeless Colorations across the stencil. I wasn't careful because I did not want a "clean" look. After all, this is Halloween right? Using the same stencil, I added a touch of Art Anthology's Mayan Gold Velvet Dimensional Paint and a few spritzes of Waimea Bay Colorations. The black webbing effect was created with an Art Anthology stencil and Ash Velvet Dimensional Paint. The ghost and letters were die cut using my Cricut Expression. I added some dazzle to the ghost by painting him with Art Anthology's Sorbet Dimensional Paint in Dazzle. A Crafter's Workshop Stencil - Beaded Curtain - was used on the letters with Art Anthology's Velvet Paint in Ash. 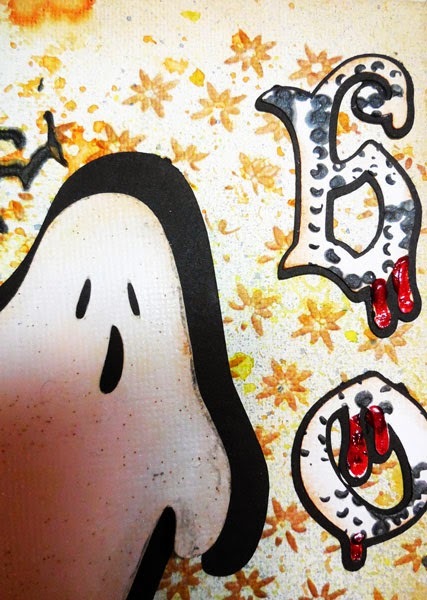 Once dry, I inked the letters and ghost with Ranger Tea Dye Distress Ink using the Ranger Mini Blending Tool. When matted, I used Art Anthology's Dimensional Crystal Glaze in Red Corvette for the dripping blood. I wanted a nice shadow for the ghost so I die cut the shadow layer larger and placed the ghost on top with foam adhesives for dimension. Isn't the ghost dazzling???? Love your stencil layering and colors. And great detail that the ghost was extended over the edge.. Thanks for sharing your art. How spooky fun Steph! love that background you created, especially the drippy blood! !